This Tuscany tourist information web site is up-dated frequently. 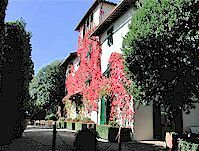 Please make use of the navigation links above and the videos below describing where to stay and what to see in Tuscany. We'll soon be covering many of the main sights of interest to tourists in Tuscany, as well as Tuscan wines, Tuscan olive oil, art and architecture, accommodations, including agriturismi and hotels in Tuscany. Click this link to learn more about Bed & Breakfast Greve in Chianti Bio "Il Cielo"